I recently applied as a publisher with Flexoffers.com and was glad that I did. They had advertisers from big companies like Walmart, Macy’s, Kohl’s, Sears, Groupon, Kmart, Best Buy, Target, Tiger Direct and so much more. I know that some of these popular advertisers are a big challenge especially to new publishers to get accepted and approved. For newbies like me, and starting as an affiliate, I think Flexoffers is a good place to start. Sometimes, new publishers who are not yet making enough sales get discouraged by the long-time-wait of Review Pending Applications and non-acceptance/approval coming from popular/huge brand name companies to join their network, but with FlexOffers they are willing to accept and pay attention to new publishers. The most important of all, they are legitimate and you will get paid plus they have very accommodating Customer Support for their publishers and will work hard with you to resolve any problems big or small the soonest possible time. With them, you can make your website work and earn money when you promote products and services. They have the latest products, promotions and online-only offers from well-known brands including niche advertisers. Their affiliate marketing content can be easily integrated into any website as text links, banner ads or as product marketing content that were created by their editorial staff. I really like their Newsletters that they send through my inbox weekly informing me of their latest deals with links plus coupons codes attached on it already. All I have to do is to login into my account and copy paste those links. Some of their advertisers provide deep links which are more helpful to publishers. I also like the fact that I no longer have to experience views or clicks from invalid clicks as well as deactivated advertisers since I joined Flexoffers.com. They work with different agencies, networks and direct advertisers in order to provide publishers their affiliate needs. Their standard payout is NET 30, and their top publishers can receive a payout on their NET 7 terms, which means that you receive your money the soonest possible time. FlexOffers.com is a premiere affiliate network that has a strong portfolio of 5,000+ popular advertisers with over 10+ years of experience in the affiliate marketing industry. They have an optimized data delivery tools and dependable payments. They ranked the eighth overall affiliate network in the Revenue+Performance Top 20 Affiliate (CPS) Network 2015 Blue Book survey. They have a team of writers and editors who produce product reviews including marketing bullets for every product and promotion within their network. Their text links as well as banner ads are easy to integrate into marketing content into your website. They also have various Content Delivery Systems that allows publishers to select how they want to integrate marketing contents on their sites. For advanced publishers, they do offer Web Services or Data Feed Subscriptions to have content automatically updated, as well as Spreadsheet and XML Downloads for manual updates. The beginner publishers can choose HTML or Java links to easily integrate marketing content on their websites. Advance publishers can use Data Feed Subscriptions to gain access to automatically updated content for each program they want to promote and all they have to do is to subscribe in order to receive updates for their approved affiliate programs. The content will update automatically via an FTP connection. Data Feed Subscriptions are recommended for intermediate webmasters who want a solution for integrating automatically updated advertising content into their websites. FlexOffers.com adds new affiliate programs to their network on a regular basis as new advertisers become available and you can instantly see them once you login through their website. 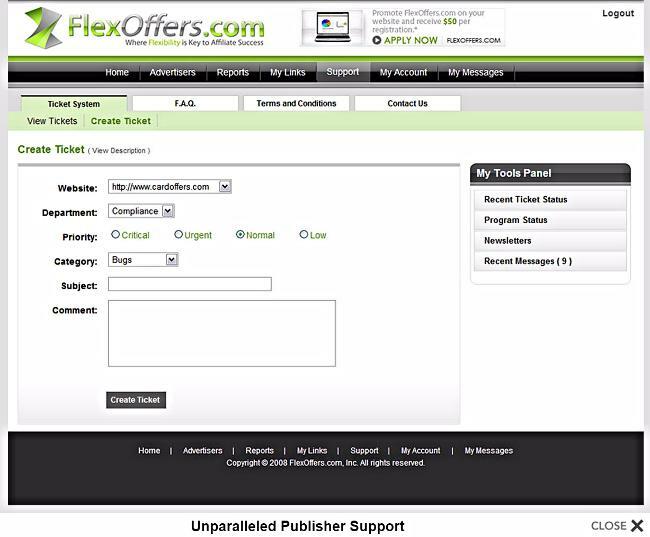 Publishers are not given a limit to the number of FlexOffers.com advertiser programs they may join. As a new publisher, you know that affiliate marketing works on a referral system. As a publisher, you can place advertising links on your websites that track customer referrals so when a customer on your website clicks on the link and is redirected to the advertiser's website, you’ll be able to receive a commission for any actions that resulted from the customer referral, such as product sales or completed applications. Earn money by promoting affiliate marketing programs through FlexOffers.com. On the other hand, affiliate programs are advertisers that are available through the FlexOffers.com affiliate network. People consider affiliate marketing as a passive income because it is an online marketing practice in which advertisers pay commissions to you as a publisher who refer customers to their products. Once you have a good working website, affiliate marketing can work on it by you simply promoting products via your site that are of interest to the online readers. FlexOffers.com provides content for all of their affiliate programs and every website is individually approved for their affiliate network. They screen new applicants the soonest time possible, but due to their large number of new applicants, it may take several business days in order to receive an approval. All their content is updated by their in-house editorial team to be 100% compliant with their advertiser standards. Online publishers will have access to some content delivery options which includes their automated content feeds with real-time updates. They offer various forms of content which includes full product reviews, bullet points, product-specific content fields, and content links with multiple options for integrating content into a publisher’s website. There are no fees to become a member of FlexOffers.com or to promote advertisers through their affiliate network. Any publisher can sign up even if they are already part of another affiliate network. They do screen a publisher’s website as part of the application process in order to meet certain advertiser standards. If you are ready to be a part of their team, you can sign up by simply filling out the Online Registration Form to apply to become an affiliate publisher with FlexOffers.com. Anyone who owns a well-designed website or blog that contains original content and does not violate their network's terms and conditions is eligible to become a publisher. You can easily generate revenue by promoting affiliate products on your well-designed website by driving traffic through your advertiser links so when customers click on your advertiser links and purchase the products you promote, you receive a commission. The amount of revenue you can earn through the FlexOffers affiliate network is unlimited and they issue commission payments through standard checks through mail or direct deposits to your bank account. Monetize your website by promoting advertiser products through FlexOffers.com. As their publisher, you get paid by receiving your commissions on a monthly basis, and this will also depend on when sales are reported by the advertisers. FlexOffers.com will send any publisher’s commissions directly to them. If ever a publisher can see those negative commissions, this only means that products were returned by the consumers. Publishers can receive their payments once they had met the $50 minimum to be paid out, and must turn in their W9 sheet to accounting@flexoffers.com before their payment is released. If the two requirements above have been met, and you were not able to receive payment, you can contact FlexOffers at support@flexoffers.com. Flexoffers.com have data feeds that offer a dynamic and interactive way for customers to browse, search and purchase products from affiliate sites which can improve your sales. They make it easy for you to incorporate advertisement products into your websites in minutes and they do not not charge you for any of their additional data feed services because all their services are 100% free to use, without any obligation. Sign up and promote affiliate marketing programs through FlexOffers.com for FREE! Please take note that we are an affiliate so we receive a commission, therefore try to do your own research when trying to avail of new products and services as well as purchase any of our affiliates products or services when you are being directed to their official website coming from this web page. All the information that are listed here is for reference only, therefore Coupon Sale Deals will not take responsibility for any loss as well as damages due to any of those promotional products or services that you will receive coming from any of our third party websites.